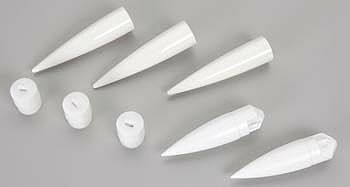 Save On Estes Model Rocket Building Materials, Nose Cone, Body Tube, Engine Hook, and more up to 60% off. A nose cone is the leading section of the rocket, with the job of reducing aerodynamic drag. 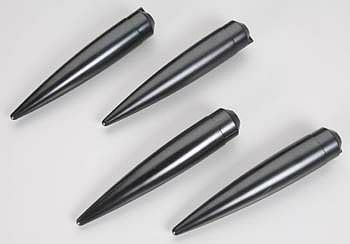 Three cones are 2-piece, two are 1-piece (all with tapered tips). Molded white plastic (2-piece, two; 1-piece, two); molded pink plastic (2-piece, one). Fits BT-50 body tubes. All have eyelets for shock cord and shroud line attachments (not included). A nose cone is the leading section of the rocket, with the job of reducing aerodynamic drag. Molded black plastic. All are 1-piece cones. Fits BT-56 body tubes. Special style--same nose. All have eyelets for shock cord and shroud line attachments (not included). High quality spiral wound paper tubes. Strong and lightweight. 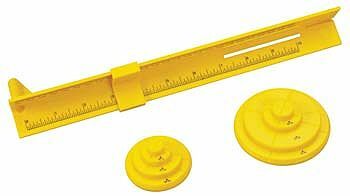 Used for custom model rockets or repair work. Plain brown tubes with a thin wax coating. Can be cut to needed length. A nose cone is the leading section of the rocket, with the job of reducing aerodynamic drag. Two different shapes: one rounded tip; one tapered tip. Both are 1-piece cones. Molded black or white plastic (tapered); molded white plastic (rounded). Fits BT-60 body tubes. Special style--Big Bertha and Bailout. PACKAGE INCLUDES: 1- Rocket Builder's Marking Guide Set 1- Tube Marking Guide 1- Fin Marking Tool for (BT-20, Bt-55, BT-80) 1- Complete Instruction 1- Fin Marking Tool for (BT-5, BT-50, BT-60). **Quickly and accurately marks body tube for fin placement and alignment. 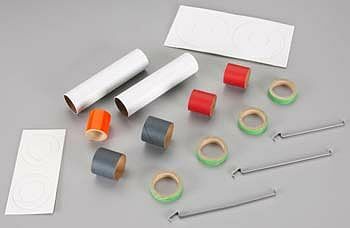 With the parts in this accessory kit, you will be able to construct two D and/or E engine mounts. An adapter is included to allow you to fly D engines in the E engine mount. The spacer ring provided allows you to ''field'' convert an E engine mount to use D engines. You can build these mounts to fit BT-55, BT-60, or BT-80 body tubes. © Hobbylinc.com. All rights reserved. Images and Descriptions are representative only, actual items may vary. Prices subject to change without notice. Hobbylinc maintains no responsibility for inadvertent errors. 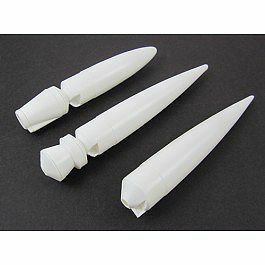 hobbylinc.com is a full line hobby shop which carries estes model rocket, model rocket, nose cones, body tubes, building materials, estes, model, rocket, building, materials, and much more.